The precipitation processes in a Cu–1.0 at.%Co–0.5 at.%Ti (Cu–1.5 at.%Co2Ti) alloy were studied using differential scanning calorimetry (DSC), transmission electron microscopy (TEM), and microhardeness measurements. 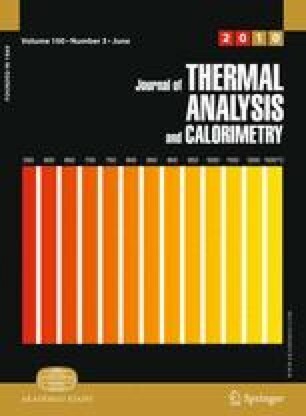 The analysis of the calorimetric curves from room temperature to 900 K shows the presence of two exothermic reactions attributed to the formation of CoTi and Co2Ti particles in the copper matrix. On the basis of enthalpy calculations, it was found that the decomposition begins with the precipitation of CoTi, followed by the formation of Co2Ti particles. The activation energies calculated using the modified Kissinger method were lower than the ones corresponding to diffusion of cobalt and titanium in copper. Kinetic parameters were obtained by a convolution method based on the Johnson–Mehl–Avrami (JMA) formalism. The values obtained for the parameter n were indicative of a particle nucleation process from preexistent nuclei. Microhardness measurements and TEM micrographs confirmed the formation of the mentioned phases. The authors would like to acknowledge the Fondo Nacional de Desarrollo Científico y Tecnológico (FONDECYT) for the financial support, Project No. 1090010. The access to specialized facilities and laboratories provided by the Instituto de Ciencias de Materiales de Sevilla, Spain and the Departamento de Ciencia de los Materiales, Facultad de Ciencias Físicas y Matemáticas, Universidad de Chile is also greatly appreciated.